Kellie and her husband are fourth-generation farmers, raising beef cattle, pigs, corn and soybeans in Dayton, Iowa. Do you have a backyard garden or potted herbs on your patio? Just as you prepare to plant veggies this spring, we are preparing for spring planting on the farm. We may start a little earlier and have more steps in the process, but the goal is the same – to grow a successful crop. On our farm, one of the ways we remain sustainable is by rotating between growing corn and soybeans. Crop rotation improves the health of our soil and helps eliminate pests because different types thrive in different crops. Both of these crops are typically planted between April and June, but we started planning for spring planting before last year’s crop was even fully harvested. As we harvest, we take note of wet areas and fields affected by disease, bugs or weeds. Below are things we can do to reduce these problems for the following year. Do you ever wonder what crop farmers do in the colder months? These are the tasks that keep us busy in the winter. Fertilizer – Nutrients in fertilizer, like nitrogen and phosphorus, are essential in the production of crops. We apply pig and cattle manure in the fall. The manure is not only a fertilizer for our crop, but it also acts as a soil conditioner and adds organic matter and other micro-nutrients. We order commercial fertilizer over the winter. Commercial fertilizers have a higher concentration of specific nutrients needed for each crop. We don’t apply fertilizer in excess, which can be harmful to the environment. Tillage – This is a term for turning the soil, which helps control weeds and pests. We till our fields before winter to prepare them for spring planting. In order to remain sustainable, we limit how often and how intensively we till in order to reduce soil erosion and nutrient runoff as much as possible. Cover crops – The best way to protect soil is to keep it covered year-round, so we plant cover crops to grow between corn and soybean crops. An added benefit of the cover crops on our farm is that we put cattle on the field during the winter to graze, and we start over again in the spring. Seed selection – We work with our seed salesmen, who are experts in crop production, to determine which seed varieties will do the best in our fields. By the time spring arrives, the planning for planting is complete. 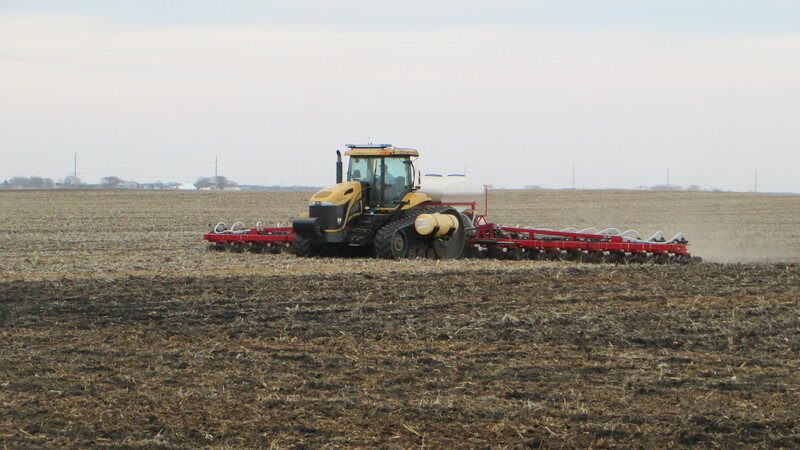 We apply fertilizer and weed-control products to the fields that need it, and then the planter can hit the soil. How do you prepare for planting your garden? What questions do you have about our preparation for planting on the farm?